Now I'm really confused; has someone beside Auggie received 30,000 and should we be partying? RSS Feed says that one other has gotten 30K but there is no link to whom. Is someone so bashful that they won’t show up? It’s 7:45 on a Monday morning and I want to throw a party. Who are you so I can “Mazel Tov” you? Or is this an error? @shego There is a party going already for Auggie. The feed seems to imply tha someone else has reached it too unless I am becoming demented. It shows Auggie twice…not that she doesn’t deserve it! Apparently the Community Feed has become schizophrenic and sees Auggie as two different people. When I click on the “1 other”, it shows Auggie again. Somethings screwy with the community feed. First it didn’t show my 30K or supermouse’s 20K, now it’s showing me twice! I let the guys know. @augustlan Well, as I said to you in my PM, if there ar two of you, it makes more sense that you can accomplish so much! I got so nervous, I checked out Jeruba to see if she had gotten there unbeknownst to me. @JilltheTooth You’re a sweetie but I don’t want to pre-empt the original party. I really thought I had missed something. @janbb I’m stalking @gailcalled myself. 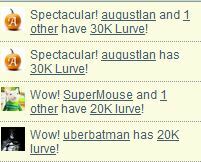 Now supermouse’s 20K is showing up twice, too! Silly feed. @gailcalled Truth from Diction That wasn’t the point; the point was that it was saying that someone new had gotten it and thus was deserving of a party. We know about the others. Careful, there, @ChazMaz , she has a BIG dog! So augustlan move into the 30k mansion? What does that make, three people? Four. Gailcalled, Auggie, JohnPowell and Marinelife. Has to be nice to be in a 200 room Mansion. Just the 4 of them. I think it’s their own island. Oh, I forgot wundayatta, so it’s 5. Hey, you guys left out Astrochuck! So she gets two islands? Cool. @marinelife Ooops… I can’t count. And Astrochuck makes 6. Affengeil, astrein, atemberaubend, ausgezeichnet, außergewöhnlich, beachtlich, beeindruckend, bestens, bezaubernd, blendent, brilliant, cool, echt super, einwandfrei, entzückend, erstklassig, exquisit, extrem stark, exzellent, fabelhaft, fantastisch, fesselnd, fulminant, genial, gigantisch, grandios, großartig, göttlich, hammer stark, hervorragend, hinreißend, hip, klasse, knorke, krass, perfekt, prima, sagenhaft, saustark, sensationell, spitze, toll, top, traumhaft, unglaublich, verdammt gut, vortrefflich, vorzüglich, weltklasse, wow, wunderbar, wundervoll. Did you pay for college? Will you seek to find out who has reached the state of 30K? What faithful lady has reached 30,000 lurve? Hey, Jude! She's at 30k!